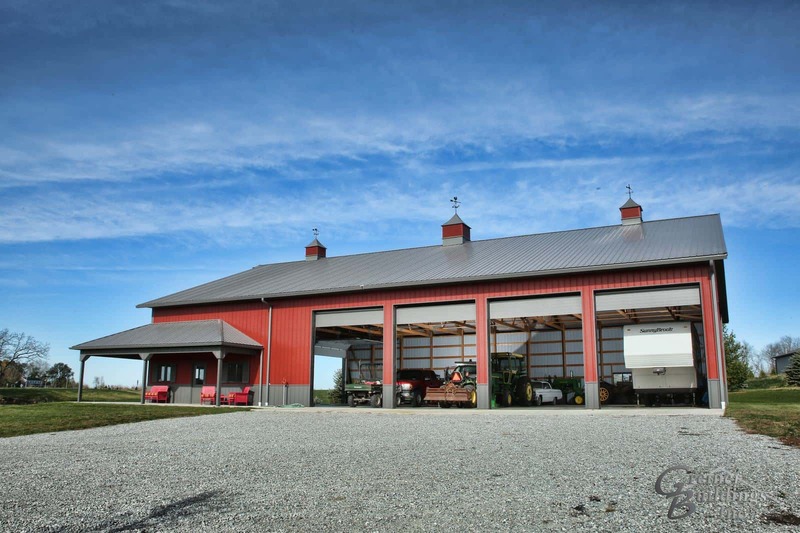 In the past, pole barn construction has widely been known as a typical type of construction for storage units, machine sheds, and work shops. However, with all of the incredible benefits that come with a post frame building, it has become increasingly popular to use pole barn construction on residential applications such as homes, garages, and hobby shops. Machine Shed in Muscatine/Scott County area by Greiner Buildings. Greiner Buildings a leader in the pole barn industry of the Midwest, creating countless custom pole buildings for all types of applications. With an increase in demand for pole barn homes and shop spaces, we have created our specialty product called the Shome®. The Shome® is a combination of shop and home: the perfect solution for modern day country living. It features an open floor plan with high ceilings, loft areas, big doors and windows, and of course, a custom shop space attached to your residential living area. For more information about building your very own Greiner Buildings Shome® in Muscatine, click here. Some of our most popular buildings in Muscatine, Iowa include event venues and similar commercial buildings. From beautiful wedding barns to commercial office spaces, we can build it all. We also construct warehouses, retail buildings, restaurants, automotive commercial buildings, and mini-storage units. To inquire about a pole barn commercial building with Greiner Buildings, give us a call today.